William Clift (1775-1849) has been mentioned several times on this blog already. 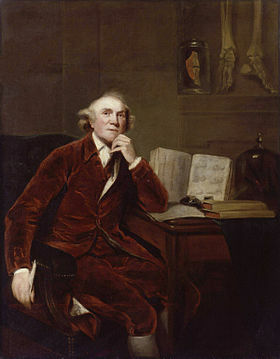 One of the reasons his language is interesting is that by studying the letters you can see how he substitutes one linguistic model, that of his sister Elizabeth (1757-1818), for an another, that of his newly found patron, the surgeon and anatomist John Hunter (1728-1793). Several instances of this can be found by close-reading Frances Austen’s article on what happened to Clift’s language when he arrived in London as Hunter’s apprentice. There is also a lot on William Clift and his language (and a little bit on that of his sister) if you check the index of my Introduction to Late Modern English (Edinburgh University Press 2009). Does anyone know of other publications on this topic? Austin, Frances (1994), ‘The effect of exposure to Standard English: The language of William Clift’, in Stein, Dieter and Ingrid Tieken-Boon van Ostade (eds.) (1994), Towards a Standard English 1600–1800. Berlin/New York: Mouton de Gruyter, 285-313. This entry was posted in 18th-century letters and tagged John Hunter, linguistic norms, William Clift. Bookmark the permalink.